Episode 115: What is an Inbound Engagement Strategy? A large part of being inbound is creating and maintaining engagement with your prospects and customers. From first contact with a prospect all the way through the buyer journey, engagement is how you stay connected to your prospects and deliver the information and, most importantly, the help they need to reach their goals. To effectively engage with prospects and customers every step of their buyer journey, across all levels of your organization, requires a solid inbound engagement strategy. 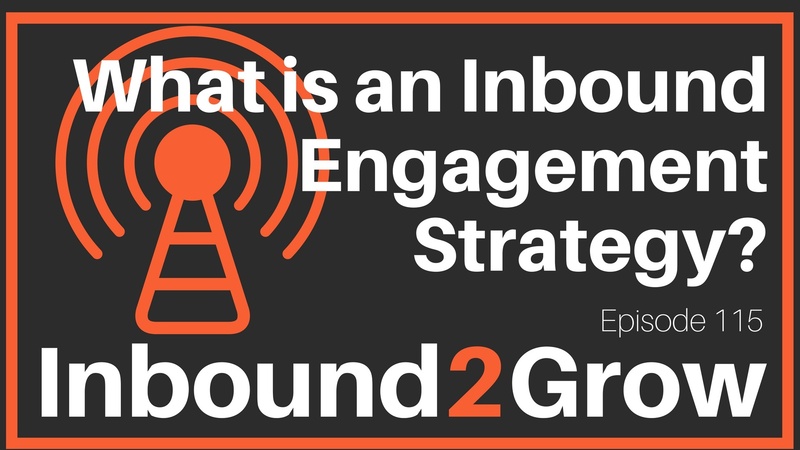 [0:41] Question: What is an Inbound Engagement Strategy? At its heart, engagement is about connecting people with the resources they need to achieve their goals. An inbound engagement strategy maps out how your organization will create engagement opportunities throughout the buyer journey and accomplish your goal of helping your prospects and customers. Content, and content creation are a large part of any inbound engagement strategy because content is going to be a primary driver of engagement. It is necessary to understand your buyer persona and your buyer journey so that you know what content your prospects need and when they need it. At the top of the funnel, for instance, the types of content that tend to be most useful are things like checklists and guides. Top of the funnel, or the awareness stage, content is about the problem your prospect is trying to solve, not about you. Middle of the funnel content, or the consideration stage, is where the prospect recognizes that they have a problem and begins to seek out solutions. At this point product demos, walkthroughs, and product comparisons (to name a few) give prospects more information about specific solutions and the specific ways you can help them solve their problem. At the bottom of the funnel prospects are ready to make a purchase and content that compares features or pricing is appropriate. Each stage needs to be considered and planned for in an inbound engagement strategy. An inbound engagement strategy also defines who you will help and how you will help them. It also details how each level of your organization will be involved in engagement. The code funnel, which is an extension of freemium, is something Dan feels strongly about. In fact, HubSpot offers a ton of free stuff that helps people help people. In a future episode, Dan and Todd will dive deep into the code funnel, the pit falls of giving things away, and more! Don’t get focused on any particular technology to reach prospects. Inbound organizations should remain human and personal. H2H is what people want! You build engagement through being human and personal, not through any specific technology. There is still time to enter the MSPOT contest! From now until Monday, September 3, you can download the MSPOT template, submit it for review, and be entered into the contest. The first place winner will win an hour to review their MSPOT with Todd and Dan!